June 28th, 2009: For the first time in over two decades, Central America has experienced a military coup d’etat. Although Honduras has had a civilian government since 1982, in the early morning hours of June 28th, the military raided President Manuel Zelaya’s home in the capital of Honduras, Tegucigalpa. The democratically elected president was kidnapped and put on a plane to San José, Costa Rica. Zelaya was ousted over apprehensions with the president’s efforts to remove presidential term limits and for being a leftist aligned with Venezuela’s president, Hugo Chávez. The Honduran Congress has replaced Zelaya with the Speaker of the Congress, Roberto Micheletti. He was sworn in as President by the National Congress. People of Honduras were left in the dark figuratively- and literally. Local television stations were either shut down or only played cartoons and soaps. The electricity was shut off and telephone lines were cut. Only the very wealthy that had internet access were able to learn about what was going on in their own country. Later that day Michiletti issued a curfew on the entire country, from 9pm to 6am. Pro-Zelaya protests started almost immediately. On July 1st, a decree was approved by Congress that allowed security officials to arrest protesters at their homes and hold them in jail for over 24 hours. When word got out to the public about Zelaya’s return, his supporters congregated outside the Brazilian Embassy. Honduran police forces used tear gas to disperse the thousands. 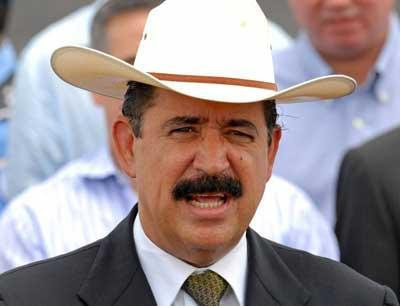 Micheletti issued a country curfew again, and requested that the Brazilian government place Zelaya in Honduran custody. The world has a very negative outlook on the crisis in Honduras. Many fear the coup will lead to violence or guerilla warfare. Every Latin American nation except for Honduras, obviously, has publicly denounced the coup and agrees that Zelaya should be returned to power. The United Nations claims it will not recognize any government in Honduras besides that of Zelaya. The OAS (Organization of American States) has suspended Honduras from the organization when the new government failed to step down and restore control to Manual Zelaya. The European Union has removed all their ambassadors from Honduras and the World Bank will not be lending any money to Honduras until the situation is solved. Zelaya’s presidential term would have ended January, 2010. If the de facto government steps down, Zelaya would finish his term but claims he would not run for re-election or accept a nomination to be president again. There is no sign of resolution to this crisis, and the people of Honduras have been living in oppression for over 80 days now. American and world organizations along with Latin American leaders continue to work towards a peaceful conclusion. "We condemn the coup d'etat and the repression of the Honduran town. Yes to democracy! "No to totalitarianism" "Live Solidarity"
I guess guy will do anything to continue to be president, even drive a trackor for a long time and hide in a truck of a car. Great blog and pictures!